Flow monitoring is the process of capturing, decoding and interpreting network traffic that contains the business objects (buy order, sell order, market data tick, quote, etc.) associated with trading activities and using these decoded or interpreted outputs to expose the performance of each tier of a highly distributed trading infrastructure. Flow monitoring provides Investment firms, and liquidity venues with the level of performance monitoring, surveillance and alerting required by ever expanding regulation, and an overall control function to improve execution performance. Users gain critical insight into the behaviour and performance of their systems and the quality of the market data they consume. Industry and regulatory demands to prove performance oversight increasingly require independent validation and verification from trusted third parties. Flow monitoring touches all network and application infrastructure points along the lifecycle of a transaction and is ideally placed to assist in demonstrating best performance or best execution to end clients. Xmetrics® is InstrumentiX’s independent, modular, high performance flow monitoring system. Xmetrics® provides holistic, real-time flow monitoring, business performance analytics and reporting across the full transaction lifecycle and associated infrastructure. At the heart of Xmetrics® is an engine for the creation of rich business and technology data, enabling performance monitoring and generation of key business metrics. 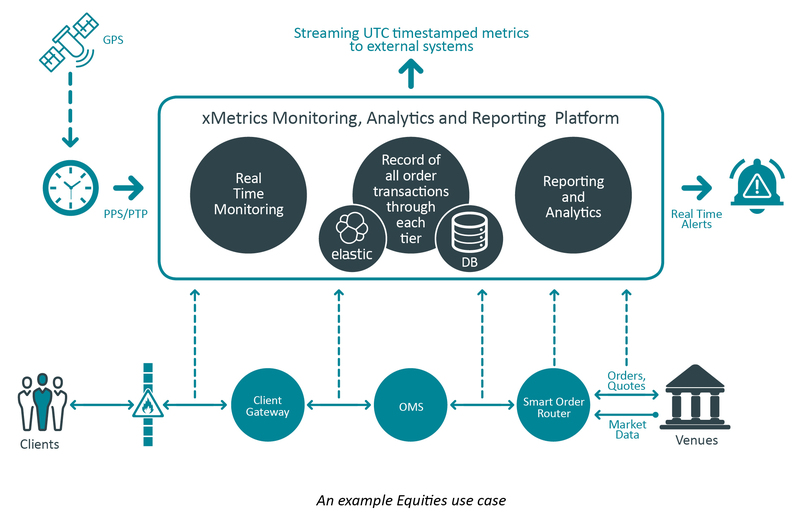 This richness ensures that Xmetrics® is far more than merely a latency monitoring solution; it creates data that can be leveraged in a myriad of ways to provide real-time visualisation, reporting and performance analysis. Xmetrics® can track, alert on and store for analysis any transaction – e.g. Ticks, Quotes and Orders - in any trading environment across all tiers and Asset Classes in real time, with no impact to production flow. Xmetrics® gathers, timestamps and decodes all traffic flowing though the tiers of the platform being instrumented. The Xmetrics® correlation engine is configured to obey the complex, nonlinear relationships inherent in today’s trading platforms and matches together decoded events to create transactions that model the performance of the environment, however complex. Xmetrics® summarises the latency dynamics of the business flows over configurable time periods using one or more dimensions such as symbol, trader etc. All events are persisted to both an industry-standard relational database and/or ElasticSearch indexes. Redundant data stores can be deployed where required to provide additional data security and resilience. Business alerts can be configured for any order, quote, tick or fill. Alerts can also be configured against transaction rates; summarised statistical measures, such as percentiles, standard deviation (jitter) and moving averages; or configured against network metrics such as bandwidth, microburst or market data gaps. Xmetrics® provides visualisation options tailored to the needs of different user groups. These include a workflow driven GUI designed for rapid drill down from high level summary data to individual transactions and a lighter weight framework which allows users to quickly and easily design their own dashboards. Alternatively we offer easy integration into other visualisation and monitoring platforms, such as ITRS Geneos or internal proprietary systems. With Xmetrics® we have taken a modular approach to design and architecture of the product, ensuring a cost effective and rapid implementation. Our approach is designed to ensure a firm’s existing architecture is never disrupted. Each tier can be licensed separately allowing our clients and partners to only deploy the elements they require to track performance, enhance their existing capabilities or support their compliance efforts. For our clients, we operate an open access policy for the data generated from their flows. We do not lock the data into our platform but allow clients to view their own data using our visualisation tools and also to extract that data to carry out further analytics using their own toolsets. The Xcharts GUI enables clients to monitor performance in real time and investigate issues using an intuitive workflow specifically designed for drill down from high level summary data to individual transactions. This allows the user to easily identify the business objects that have been affected by performance issues. In addition to illustrating performance in real time, the dashboards are overlaid with other key alerts and events such as outliers, bandwidth and microburst. In the case of the outliers series the user has full control over the metadata exposed in the tooltip. Xmetrics® Genesis is an extremely flexible visualisation framework popular with users who want complete control over the layout of their dashboards. Xmetrics® Genesis is primarily intended to present timeseries data, but also includes alert viewing and transaction search capabilities, allowing users to quickly find quotes or orders based on any search criteria. Xmetrics® is also supplied with a powerful BI reporting engine allowing data and analysis to be regularly provided to key stakeholders. Also available with Xmetrics® is an advanced visualisation framework, which facilitates deep-dive into the rich data being created by Xmetrics®. The inclusion of this platform complements Xcharts & Genesis by allowing the user complete control over the visualisation of their data, allowing for true analytics. Unlike the other visualisation options, presentation of data can be sliced and diced without time series representation and many powerful visualisation elements are available, such as custom data tables, word clouds and document-driven query result views. Xmetrics® is easy to integrate with existing systems and In addition to traditional integration methodology, the Xmetrics® products can be deployed as ‘middleware’: one or more elements of the Xmetrics® platform can be dropped into existing client infrastructures, leveraging existing processes and architectures. InstrumentiX publishes all internal protocols making it possible to use one or more tiers of the platform to integrate entirely with client’s existing infrastructure. IT resources are finite and for clients without internal access to the requisite – highly skilled IT resources, Xmetrics® is available as a managed service. Xmetrics® can be deployed and customised with firm-specific, personalised configurations, dashboards and views, fully managed by the InstrumentiX team. A full run the bank (RTB) / business as usual (BAU) support function is included, with any changes to the platform required as a result of change within the organisation fully managed and fine-tuned with the expert knowledge of the InstrumentiX team.